There are many court reporters who partake in activities outside of the courtroom. Sure, some of these activities may have started out as a hobby to unwind after a long day at the office. But as time passed, the skills gained from these activities have become a great benefit. In many cases, these skills have kept reporters focused or even helped to improve dexterity and posture. From sign language and yoga to knitting and ballroom dancing, these skills have made a difference in and out of the courtroom. The dexterity of knitting also keeps her fingers nimble, an advantage to her as a court reporter. Heierman adds that it also helps keep both her profession and her knitting skills in perspective. When she compares her growth within the field of sewing to her career as a court reporter, she relates it’s important to embrace the changes in technology. “It is in this way I can produce a beautiful quilt and an accurate transcript with ease. As I sit before my sewing machine, I am immediately transformed.” Lavan says her mind lingers and often thinks about a job that may have caused some anxiety or a situation that arose on a job that frazzled her. 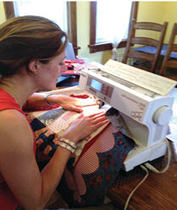 She uses the time while quilting to think how she can address those situations the next time she is faced with them. It seems as though with each machine — whether it’s for sewing or writing — Lavan finds similarities. When she goes to quilt shows and sees others’ finished pieces, sometimes she thinks, “I could never do that.” But before long, she’s buying the kit or pattern to tackle the project herself. She used to think, “I can never be a realtime reporter,” and while she’s still mastering her skills for certification, she now fully believes it’s an attainable goal. Plexico adds that interpreting gave her knowledge of the educational setting and environment, as well as what to expect. “Physically, both jobs incorporate the same long hours of sitting, listening, and language processing, so I felt better prepared for those aspects,” she explains. And it comes in handy when communicating with the hard-of-hearing and deaf students who need CART. “I do believe it would have been more of a challenge to gain CART skills if I didn’t have the interpreting skills first because the two are so similar. Interpreting has enhanced my skills in the areas of manual dexterity and listening and has given me access to collegiate-level terminology I might not have otherwise had,” she says. 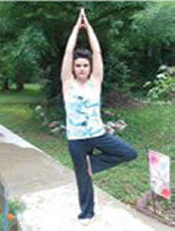 Vicki Britt, RPR, from Sacramento, Calif., is a freelancer who is also a certified Pilates instructor. What started out as a hobby turned into a skill she uses to help others when she teaches Pilates. Not only has it been a big stress reliever, it has increased her posture in the court, helped the tension between her shoulders after a long day of reporting, and helped her stay calm by using correct breathing during tense or fast situations in the court. 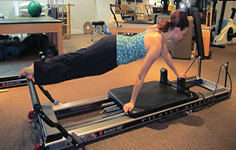 She took her first Pilates class more than 15 years ago and was hooked immediately. Seven years ago she started teaching after getting her certification. “Our court reporting profession and lifestyles are sedentary. We commonly carry stress in our shoulders, neck, and lower back. Conscious breathing and connecting your movement with your breath helps the body relax. All of this helps me keep a clear, quieter mind when I am working,” she says. For Willi Hill, retired court reporter, from Orange, Calif., her career would have likely been cut short if she hadn’t found ballroom dancing to keep her back and shoulders strong. Thanks in part to the dancing, she worked for Los Angeles County Superior Court for 25 years before retiring in January 2001. She remembers vividly how her introduction to the dance floor began. It was 1985 and she wanted to lose 30 pounds, so she went to her doctor for diet pills. Her doctor agreed to a one-month prescription but also told her to start an exercise routine and not just any exercise. He asked her to choose an activity that she really enjoyed in hopes she’d stick with it. Shortly thereafter, she saw an ad for a free dance lesson, which Hill describes as a one-hour free dance lesson along with a sales pitch. She signed up and was hooked right away. Hill adds that she sometimes joked if she hadn’t found ballroom dancing; she would have been on the psychiatrist’s couch. “Ballroom dancing was very therapeutic for me. It was physical exercise as well as an emotional outlet,” says Hill. In fact, she enjoyed dancing so much that she started dancing competitively and over the years collected quite a few trophies as well as costumes. Linda Wolfe, RMR, from Sarasota, Fla., started playing tennis in 1991 and over the years began captaining United States Tennis Association teams. Wolfe mentions that tennis and court reporting are not only physical but mental. “I love tennis because if you make a mistake, you have to mentally move on and not dwell on your bad shot. Much like court reporting, if you miss a perfect stroke, you either try to correct it immediately or move on. You can’t dwell on what you just heard in a deposition or the bad tennis shot you just made,” says Wolfe. Wolfe has owned her court reporting company since the early 80s and found owning the business has helped in many ways when it comes to working with tennis teams. “Court reporting requires you to be organized and recruiting team players, organizing matches, and then playing the match requires skills the average team captain does not possess. I found owning a court reporting business helped me juggle the demands of tennis teams.” But it’s not just about being organized. It’s about keeping cool under pressure, especially in court reporting. “The room is filled with tension, but you have to write on your machine under intense pressure,” she says. Linda Smolkin is a writer and editor for the JCR. She can be reached at lsmolkin@ncra.org. This article was originally published in the Journal of Court Reporting, NCRA.